Part two of this three-part article examines the different ways to mask and remove restroom odors. There’s an entire science built up around aromatherapy. Scientists have found that people tend to enjoy a light fragrance, whereas a heavy masking fragrance is nearly as bad as having a foul odor. “A light fragrance can be somewhat inviting and indicates the place is very clean,” says Huizenga. 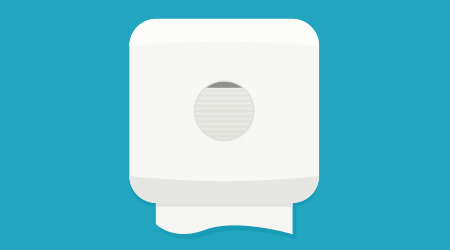 The two most common types of fragrance dispensers are aerosol dispensers and gel units. Aerosol dispensers are acceptable for most applications, he says. There are several dispenser sizes to choose from, including high-capacity units that deliver 900 shots per refill and economy-sized units that must be changed out more often. Programmable fragrance dispensers may also be appropriate for customers that want a little more control. These units enable the BSC to select how often they spray the fragrance and can be set to not spray on weekends or at night. “You pay a little more for those dispensers, but they ultimately pay for themselves by not spraying when you don’t need them to, thereby extending the life of the refill,” says Tim Murch, president and CEO of 4M Building Solutions in St. Louis. In high-traffic restrooms, Huizenga recommends using metered aerosols instead of gels. Although this type of system works well in high-traffic restrooms, it might not work as well in smaller, low-traffic restrooms with closed doors. In these restrooms it’s important to adjust the passive fragrance to the size of the space. Odor-absorbing gels also work to mask odors in the air. These are popular in convenience store restrooms, rest areas, portable toilets and facilities with low traffic. They can last up to 30 days, says Murch. Gels may not work as well as their metered aerosol counterparts, because they emit more fragrance at the beginning of their life and less at the end. Passive fragrance programs are engineered to last for longer intervals than gels, an important consideration if workers have to go change them. And because the unit’s are placed high enough to avoid tampering by the public, changing dispensers requires workers to get on a ladder. Therefore, a longer-lasting fragrance requires less labor.